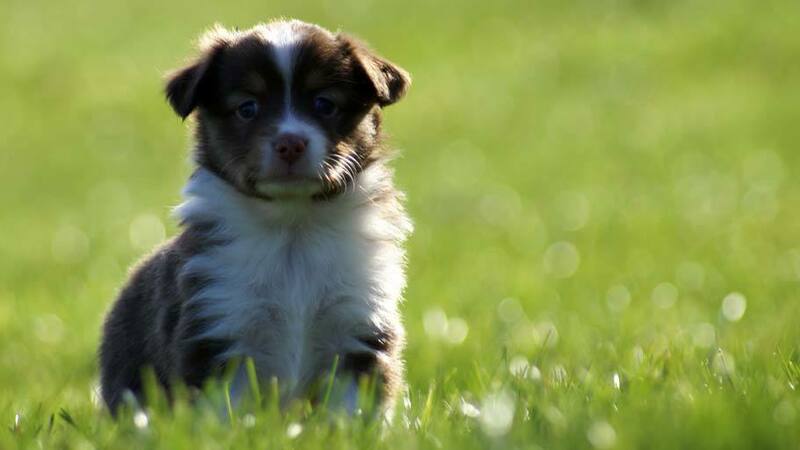 Available Mini Aussie puppies from October 2010 at Breezemore's Maine Miniature Australian Shepherds. 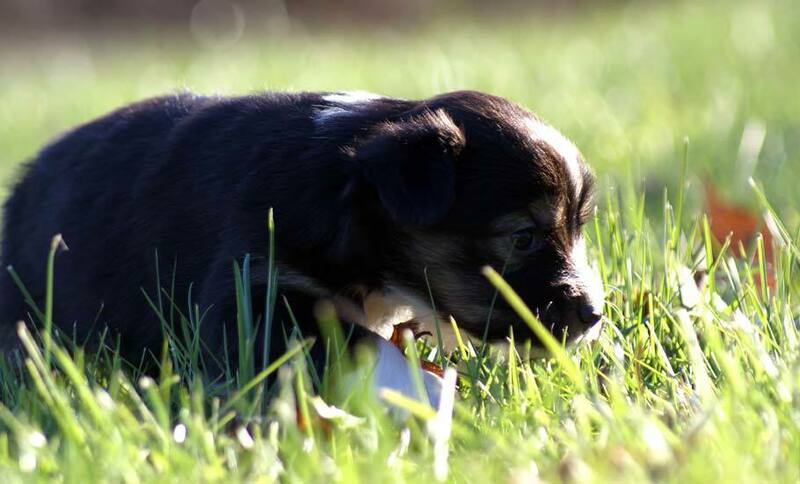 October 2010: New Miniature Australian Shepherd Puppies! On October 16th Jazzy and Eli had a litter of eight little puppies (2 males and 6 females). These puppies will be 8 weeks old on December 11th. 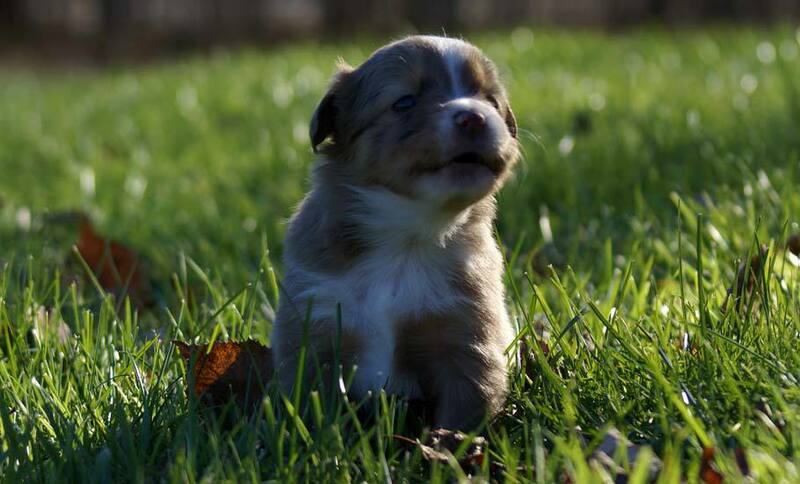 The picture below were taken at five weeks old. The puppies can be registered under the National Stock Dog Registry and are pets with a spay/neuter per our puppy contract (pdf link). Sweet guy; he loves attention and takes everything in stride. Half of his collar is wide, then narrows to a full collar. He has nice copper trim that contrasts well. 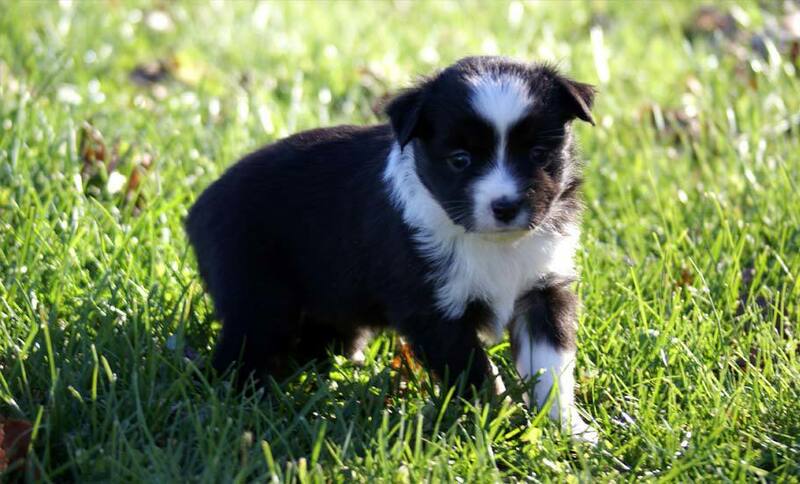 To the right is a photo of him at 4 weeks old that can be clicked to enlarge (a week prior to the picture above). Playful and loving. Flashy guy with a wide 3/4 collar and a huge blaze. Looks he'll have two blue eyes. We had been calling him Beast Mode Activated. Click to enlarge his 4-week picture to the right. She's a pretty pup with a deep mahogany color, bright copper trim and a 3/4 collar. Full of puppy kisses. At right is a pic 1 week earlier at 4 weeks. Sold: They have named her Acadia! Pretty little girl with a 3/4+ collar. Small mini, may be a toy. She's a sweet pup always up for a cuddle. We had been calling her Daphne Doodles. 5 weeks above, 4 weeks to the right! Sold. Thank-you, Olivers. They have named her Lila! A lot of nice copper trim on her face. Sweet as can be; ready to play then snuggle in for a nap. Click to enlarge her 4 week picture to the right. Sold. Thank-you, Allens. They have named her Adelaide! Sold. They have named her Bella! Darker red with nice merling. Toss up on the eyes... two blue or two green. Depends on the light right now. Small mini, possible toy. She loves to cuddle but is ready to play. Here is Harlow's old picture at 4 weeks old to the right. Click to enlarge. Sold. She's been name Harlow!